Numerous television and radio news outlets in Nicaragua were attacked or experienced signal interruptions during coverage of the wave of protests that erupted throughout the country due to a reform to the Social Security Law by the government of President Daniel Ortega. The directors of the Nicaraguan channels CDNN 23, Canal 12, Canal 100% Noticias and Canal 51 denounced having been censored with the interruption of their cable signal while covering the demonstrations, El Nuevo Diario reported. The company that provides the cable transmission service only responded that this was due to temporary technical failures. The Office of the Special Rapporteur for Freedom of Expression of the Inter-American Commission on Human Rights (IACHR) reported on its website that the director of 100% Noticias, Miguel Mora, denounced that he was contacted by the government to stop covering the protests with the threat that his signal would be interrupted, which in the end did occur. Some channels managed to resume their broadcast within a few hours and others eventually resumed days later, as is the case with 100% Noticias. When its signal returned on April 24, it had no audio, the media outlet reported through its Twitter account. Regarding the situation of violence and mass protests in the country, the Nicaraguan Center for Human Rights (Cenidh, for its initials in Spanish) issued a statement on April 22 condemning the deaths of demonstrators, many of them students who lost their lives during the protests in which the organization says they were attacked by police forces and parastatal groups. The agency also lamented the murder of journalist Ángel Eduardo Gahona, owner of local media El Meridiano in Bluefields, who was fatally shot in the head while covering the demonstrations via Facebook Live on April 21. "This criminal act represents an escalation of the violence that journalists have suffered in recent days, as well as the violation of freedom of expression represented in the burning of Radio Darío radio station in León," the statement said. On Friday, April 20, a group of strangers who arrived in two vans at the facilities of Radio Darío, broke the door of the station, aimed at the doorman, sprayed gallons of gasoline inside the radio and on the roof, and fired a mortar that burned everything, including the person who fired the shot, said director of the radio station, Aníbal Toruño, according to the Nicaraguan newspaper La Prensa. Shortly after, on April 27, Toruño gave more details about the attack on Radio Darío at a press conference organized by Cenidh. According to Toruño, he was inside the radio station with 11 other people, three of them journalists, when the attack that left the radio offices in rubble happened. "It was a terrorist attack that aimed to end the life of its director and also of all of us who were putting together the live broadcast (of the citizen protests)," he said. Also, Toruño accused congressman of the Sandinista National Liberation Front and vice president of the Peace Commission of the National Assembly, Filiberto Rodríguez, as being responsible for the fire at his station, according to 100% Noticias. According to the news site, Toruño blamed the national police and the government for what might happen to him, his family or his workers. Rodríguez did not immediately respond to a request for comment from the Knight Center. 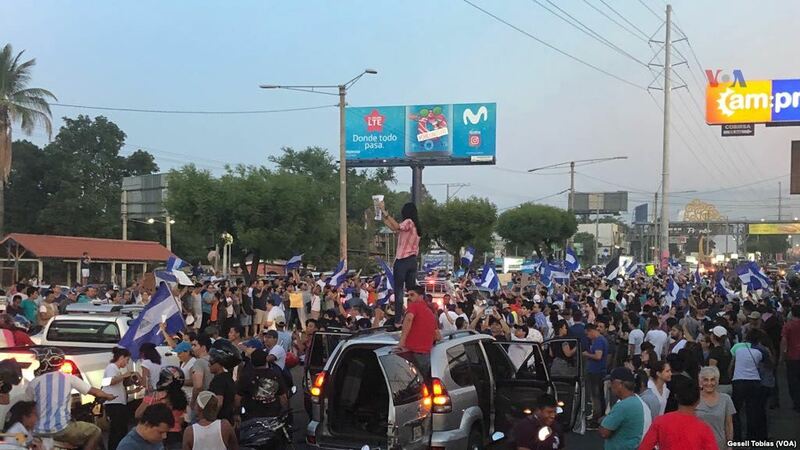 "I appeal to the sanity and reason of President Daniel Ortega, that this can not continue to happen in Nicaragua," the owner of Radio Darío said, according to 100% Noticias. On April 30, the journalist and owner of Radio Mi Voz radio station, Álvaro Moltaván, reported receiving death threats against himself and threats against his station, 100% Noticias published. "My family and I have been outside the house, outside the radio, even the radio had to go off the air after what we saw with Radio Darío," Montalván said according to 100% Noticias. According to the news site, Montalván also reported recent signal interference at his station by the frequency of state radio station Radio Ya. In an opinion column from the Nicaraguan media outlet Confidencial, journalist Carlos Salinas said that the attacks on at least eleven journalists and the "blatant censorship" of four television channels that were removed from the air by Telcor, the telecommunications regulator, is a "show of the dictatorial drift" of the Ortega regime. According to Confidential, journalists who were attacked "with brutality" by government supporters while covering the protests are: Julio López, Alfredo Zúñiga, René Cuadra, Carlos Herrera, Néstor Arce, Maynor Salazar, Ricardo Salgado, Róger Sánchez, Melissa Aguilera, Roy Moncada and Emilio Chamorro. The IACHR and its Special Rapporteur for Freedom of Expression stated on its site that attacks against journalists and the destruction of equipment of those who cover these situations violate freedom of expression, both individually and collectively. The entity also referred to the withdrawal of signal from TV channels as a form of censorship that violates the right of a society to be informed about matters of public interest. Additionally, the IACHR informed that it will request that the Ortega government allow them to make a working visit to Nicaragua to assess the situation. According to data from the Red Cross of Nicaragua and local human rights groups, since the protests began on April 18, at least 28 people have died, 435 have been injured and 242 of them are hospitalized, Human Rights Watch reported. However, in the latest update on the death toll by Cenidh, it’s possible that 43 Nicaraguans have lost their lives so far, CNN reported. The Committee to Protect Journalists (CPJ) has released a safety advisory and suggestions for journalists in Nicaragua reporting on crowd violence or mobs. It is available in English and Spanish.